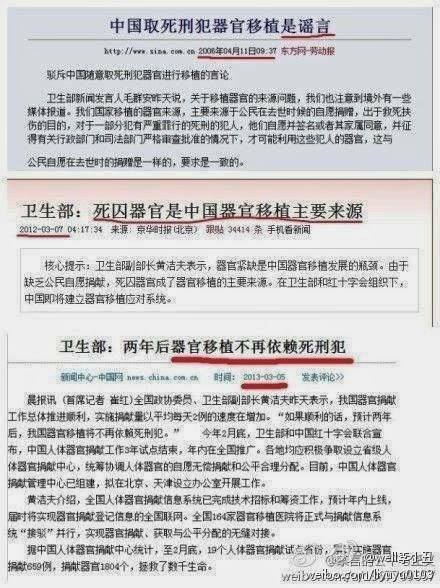 This picture shows 3 contradicting official reports regarding organ sources in China. Title of report 3: Health Ministry: We Won’t Reply on Executed Prisoners for Organ Transplants Two Yeas Later. Published on March 5, 2013, when the crime of live organ harvesting of Falun Gong practitioners had become too difficult to cover up; and when the Chinese Communist Party wanted to “create” a convincing source to continue with the hugely “profitable” business of mass killing innocent people(mainly Falun Gong practitioners) for their organs. Now they just count the killed as “volunteer donors”. What saddens me is that some western doctors and even professional organizations are willingly buying this nonsense!